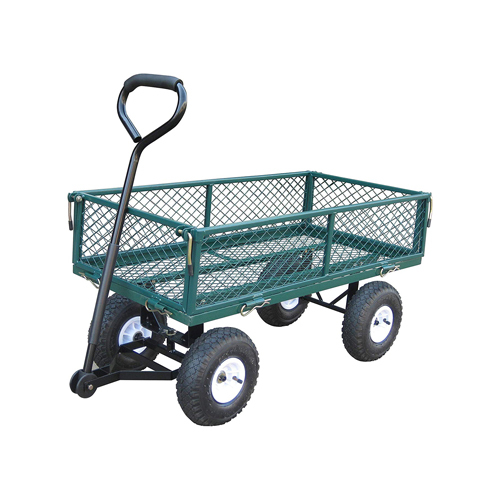 This Cart is easily pulled by a Lawn & Garden Tractor, UTV or ATV. 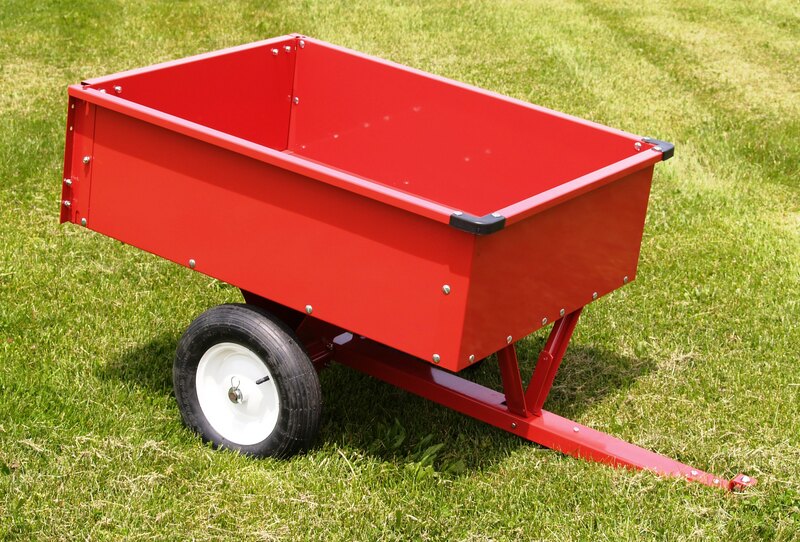 Our Steel Dump Cart is Ideal for Pulling Behind your Lawn Tractor, Garden Tractor, ATV or UTV for Hauling Anything you Need. Speed up Lawn Clean up this Spring and be ready for Summer as well! With a Load Capacity of 10 Cu. 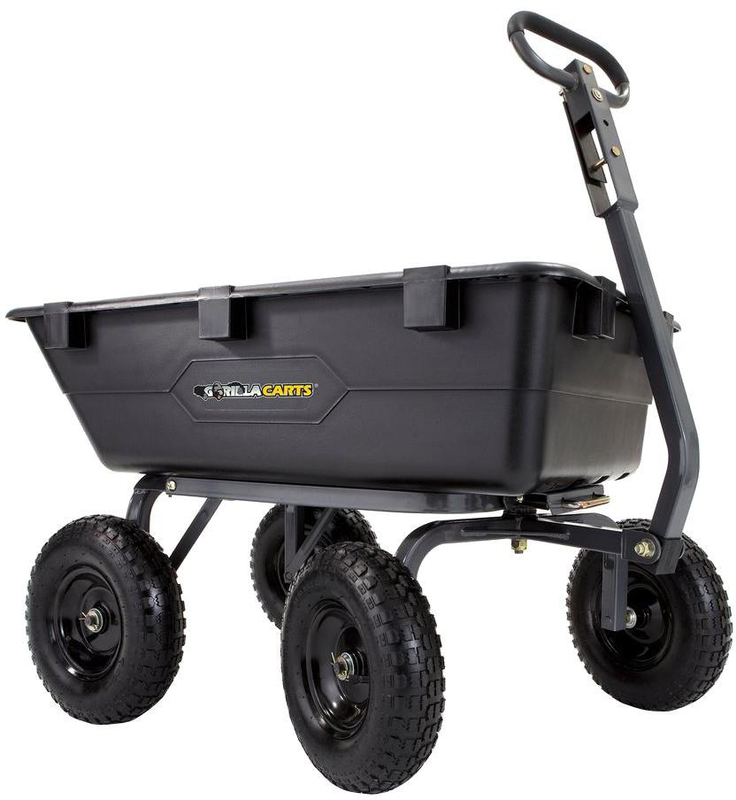 Ft. and 500 Pounds Our Steel Dump Cart can Handle most Lawn and Garden chores. Even around the barnyard it has many uses, hauling bales, feed, small tools, and supplies are just a few. It utilizes a Pin Style Hitch, with a Removable Tailgate, and Dump Capability for Easy Unloading. 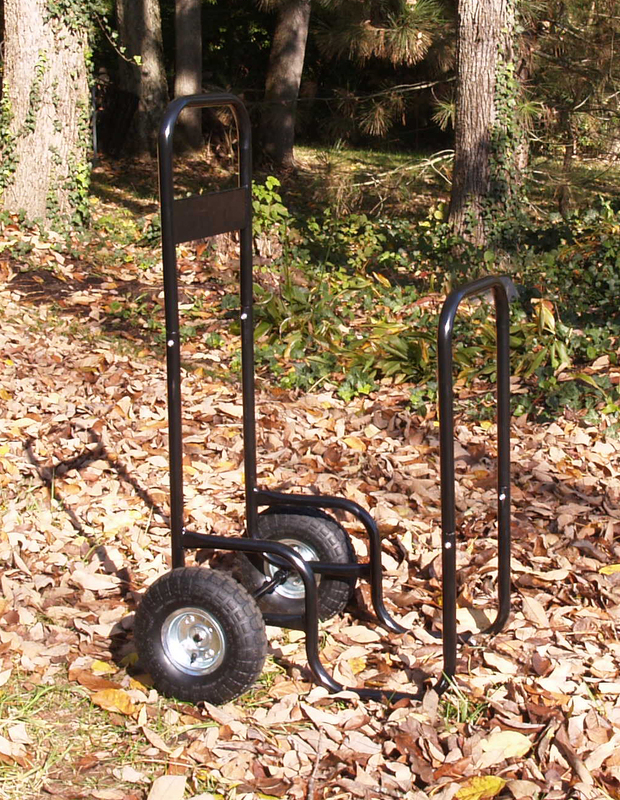 Use it when Hunting or Camping, this Cart can Handle most Campsite and Field Chores. A Great Alternative for those who Prefer the Strength of all Steel Construction! Bed Dimensions: 42 in. x 29 ½ in. x 12 in. Overall Size - 62 in. L x 33 in. W x 30 in. 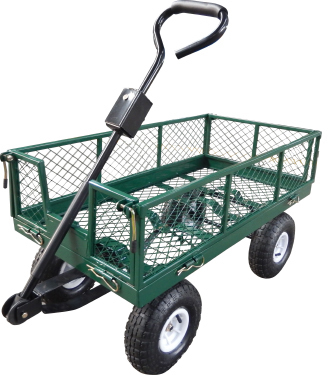 H.
Load up the Sportsman Series Flatbed Cart with bags of soil for the flower beds, grass seed for the lawn, supplies for painting the deck, or grain for the horses. The 36 x 18 inch welded steel mesh deck can hold a load of up to 550 pounds. With that much weight capacity, this Flatbed Cart can handle just about any load you throw on it. Pneumatic wheels make it easy to maneuver over almost any terrain. A powder coat finish will stand up to the elements and resist rust and corrosion. 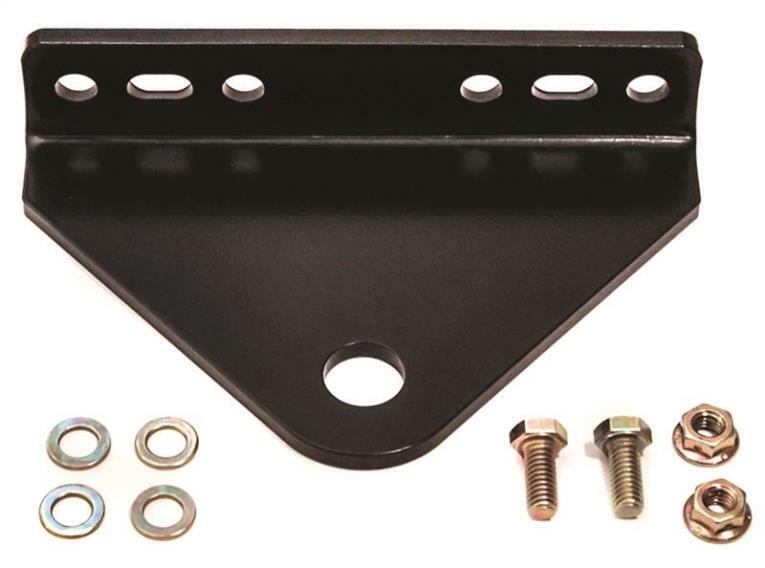 You can even tow the Flatbed Cart behind your lawnmower or tractor with the included trailer hitch adapter. This Flatbed Cart will give you a helping hand on any project around the house. Say goodbye to the back-and-forth task of transporting and disposing debris in the garden. 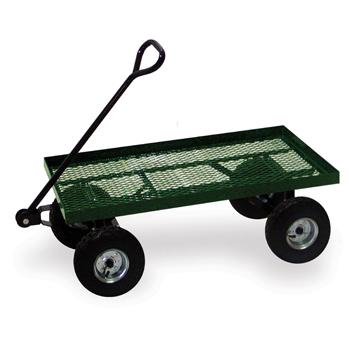 This reliable Garden Cart quickly gets the job done for you, without the strain. 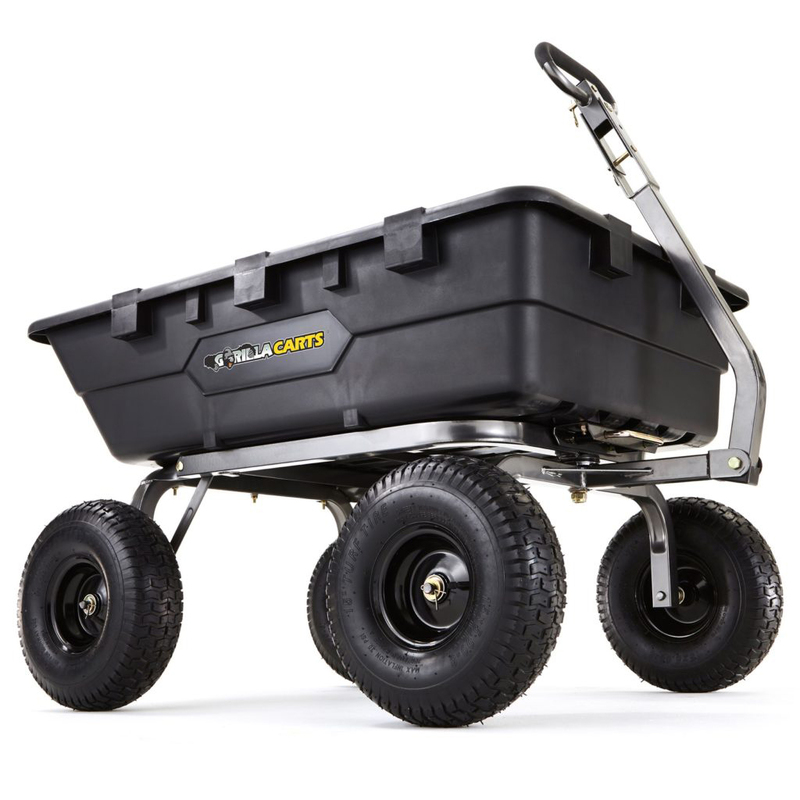 The 10�x3� large pneumatic tires make getting over rocks and grass a breeze and the fold down side panels allow easy access when you need it. Pivot push and pull action anyone can do! This Cart is a Must! Great Product for the Yard, Barn, Greenhouse and Dock! For those who move Large Loads of Yard Debris, such as Leaves and Tree Branches, as well as, Plants, Trees, Logs, Lumber, Gravel, Rocks and Blocks. Perfect for use in the Barn for Hauling Hay Bales and Animal Feed. This Versatile Cart is an Effective Tool for the Transportation of Lawn Furniture, Pool Toys & Accessories, Vehicle Cleaning & Maintenance Supplies, and Trash Cans. This Cart has many Potential Uses and is much More Stable than a traditional wheelbarrow! This Cart is Designed to be Pushed or Pulled. Construction: Powder Coated Steel Frame and Painted Plywood Panels. 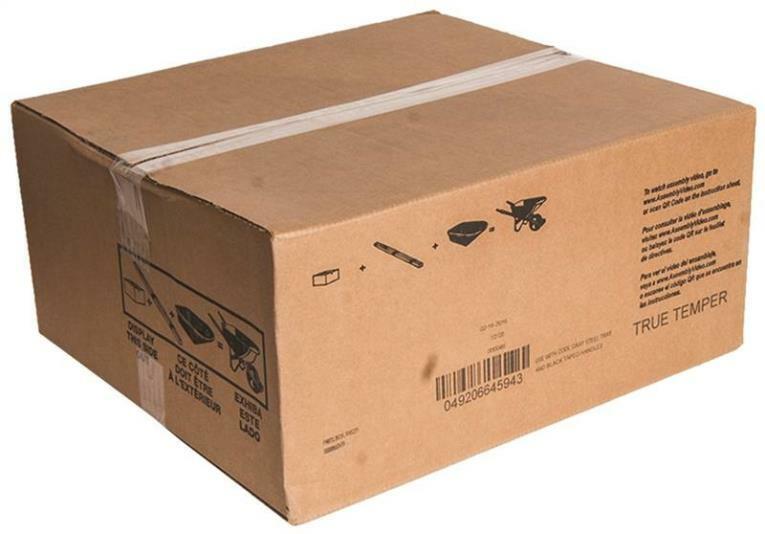 Removable Front Panel for Loading and Unloading. Weight is Carried Over the Axle instead of Slung Between Axle and Handle Like a Traditional Wheelbarrow thereby Reducing the Weight Carried on the Handle. Maximum Load Capacity: 300 Lbs. Standard-Duty Cart not Big Enough? For those who move Larger Loads, This Cart is a Must! Great Product for the Yard, Barn, Greenhouse and Dock! A Multi-Purpose, Large Cart, Designed to Ease Everyday Chores in the Yard (Moving Debris, such as Leaves and Tree Branches, as well as, Plants, Trees, Logs, Lumber, Gravel, Rocks and Blocks), Garden (Handling Plants, Seeds, Fertilizer, Tools, etc. ), Boat Dock (Transporting Equipment, Supplies and Fishing Gear), and Barn (Hauling Hay or Straw Bales and Feed) to name a few ... 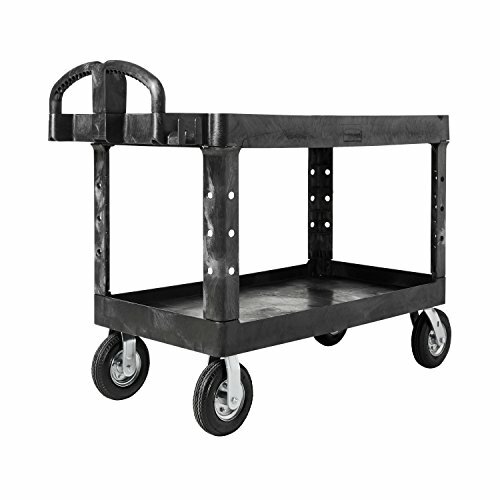 This Versatile Cart Easily Balances Heavy Loads while providing Strength and Stability. This Versatile Cart is an Effective Tool for the Transportation of Lawn Furniture, Pool Toys & Accessories, Vehicle Cleaning & Maintenance Supplies, and Trash Cans. This Cart has many Potential Uses. This Cart is Designed to be Pushed or Pulled. Maximum Load Capacity: 400 Lbs. Carry firewood from the woodpile to the house in fewer trips! The Mid West Products Log Cart reduces the risk of falling on icy sidewalks with an armful of wood. Be prepared for those winter storms! The Mid West Products Log Cart will haul approximately six to eight armloads in one trip. You'll spend more time enjoying the warmth of the fire and less time trudging out for more wood. Makes an excellent chainsaw accessory. You'll be amazed at what the Mid West Products Log Cart can do for you! It can be used year-round for all types of hauling jobs. 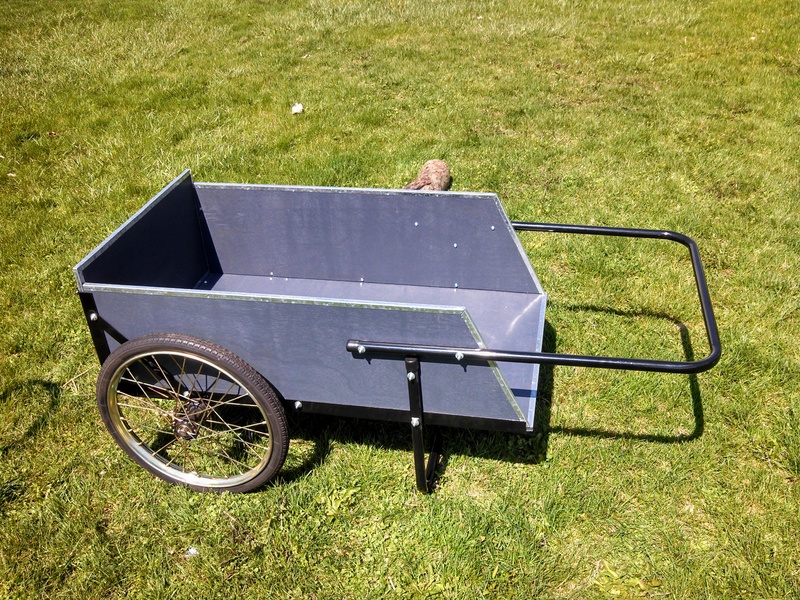 Transport garbage cans to the street, haul bales of peat moss to the garden, even wheel bags of groceries from the car directly into the kitchen using a simple box are just a couple other uses for this Cart. So get you a Mid West Products Log Cart Today! Hold Loads up to 200 Pounds. Get your canoe or kayak from the car to the water quickly and easily with the Kuda Kayak/Canoe Trolly. Transporting a heavy canoe or awkward kayak from the lot to the water can be quite a hassle, especially if you are by yourself. The Kuda Kayak Dolly can hold kayaks and canoes weighing up to 110 lbs, and the 10 inch pneumatic wheels can maneuver almost any surface. Included tie down straps and rubber bumpers keep the boat in place. The lightweight marine grade aluminum frame collapses for easy storage. 1200 LB. H-D POLY YARD DUMP CART Gorilla cart is durable with heavy-duty poly - tub that is easy to clean and won't rust Easy to maneuver cart has tight-turning steering Patented 2-in-1 handle allows cart to be towed- behind lawn tractor, ATV or pulled by hand Balanced 4-wheel stability - 13" pneumatic tires Patented quick release dumping system Powder-coated steel frame is easy to assemble GOR6PS 1200LB POLY DUMP CART SIZE:1200# Capacity COLOR:CharcoalDimensions: 44" x 25.7" x 26.2"Bed Size: 40" x 25.6"
The Wheeleasy+ line of ground-flush loading garden carts are in a league of their own. 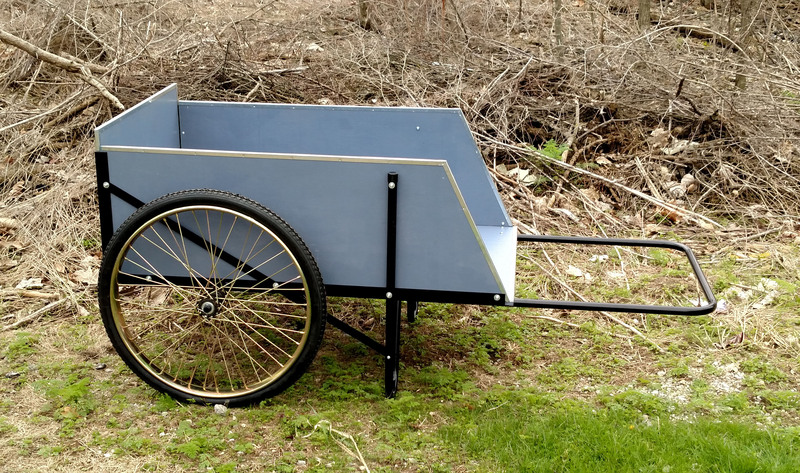 Unlike anything else on the market today, Wheeleasy's+ unique soft-sided canvas barrow lays flat on the ground where gardening takes place. Just sweep, rake, roll, slide or drag directly into the canvas barrow- no heavy or awkward lifting required. The Wheeleasy+ is available in two sizes. Use the original WheelEasy+ for big jobs, since it has a capacity of 350 lbs. The WheelEasy+ LE is great for city dwellers and homes with smaller yards and holds up to 150 lbs. Color: Light taupe. Use to store & transport mulch, dirt, & other outdoor items. Lightweight easy to use. Durable construction. 15 Gallon Capacity. Telescoping handle for easy use, 7 wheels; metal axle. Telescoping handle for easy use, 7 wheels; metal axle. 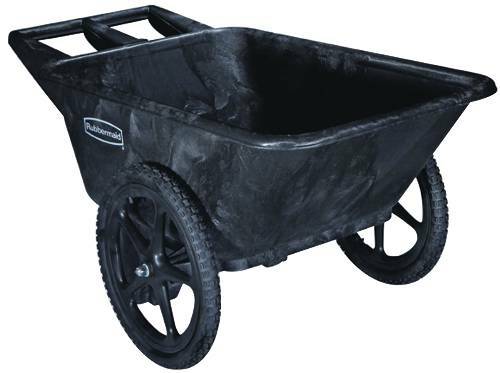 The Rubbermaid Commercial Big Wheel Cart is a professional-grade wheelbarrow constructed of high-density polyethylene with seamless design. 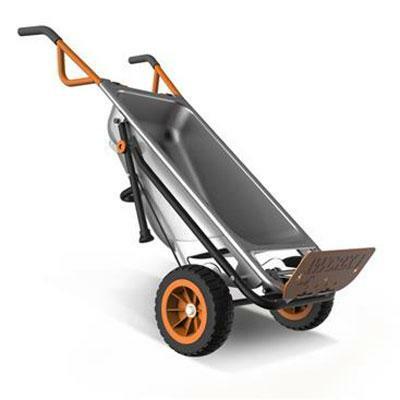 This wheel barrow has a smooth, one-piece tub that is easy to dump and clean. 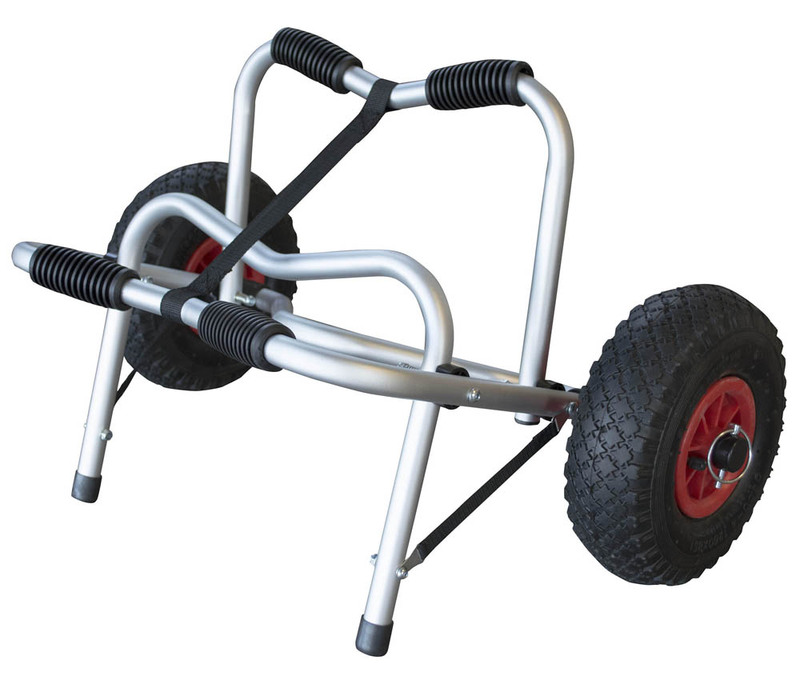 2 large pneumatic wheels make the cart easy to maneuver while ergonomically designed handles reduce strain and make the wheelbarrow easy to lift. Able to carry up to 300 lbs., these farm carts can handle heavy-duty use. Color: Black; Capacity (Weight): 300 lbs. 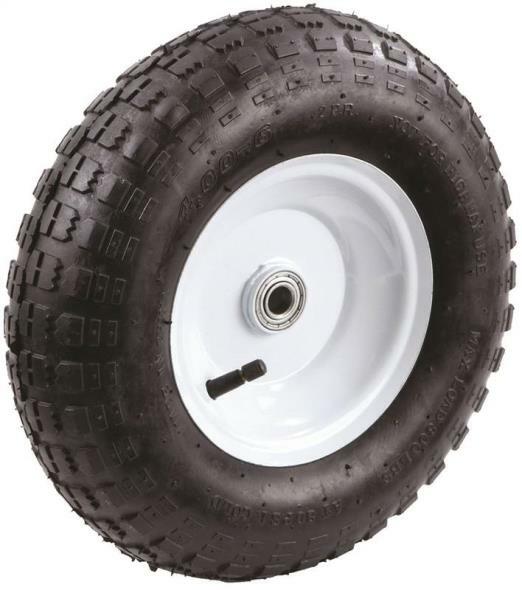 ; Caster/Glide/Wheel: Two 20" Pneumatic Mag Wheels; Material(s): Structural Foam. Designed for heavy-duty, long-lasting use. Sturdy, structural foam construction won't rust, dent, chip or peel. All-plastic, seamless pan design resists leaking and cracking. 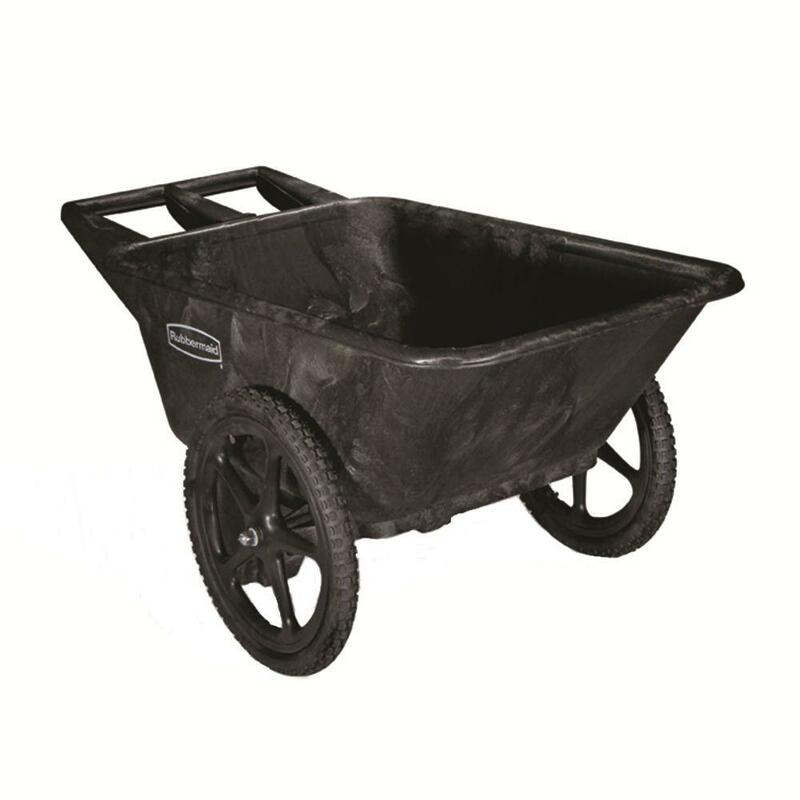 Handy, durable utility cart features rust-, dent-, chip- and peel-proof structural foam construction. Ergonomically designed push handle provides optimum hand placement and push height improving control and worker safety. Molded-in storage compartments, holsters, hooks and notches. Rounded corners and shelf walls won't damage furniture and walls. Variable grip-height handle improves control and worker safety. Built-in tool holster and molded-in fittings allow for easy addition of pipes or rods. 750 lb. capacity. 5-inch TPR casters. 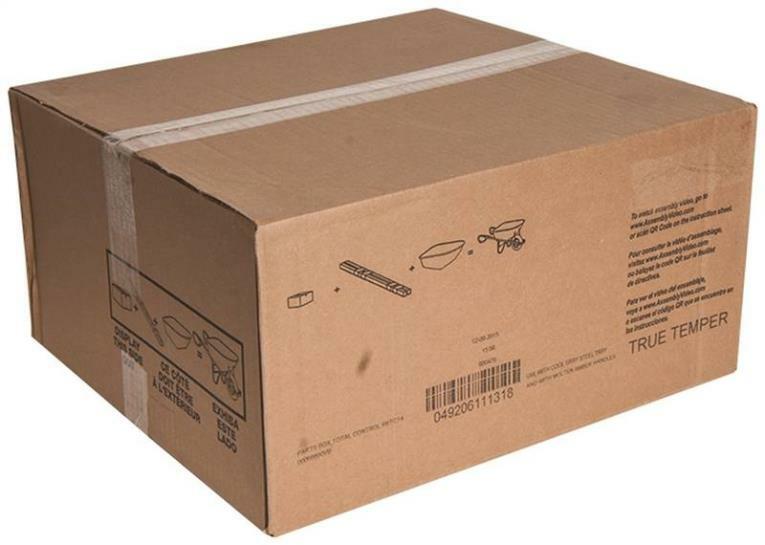 Color: Black; Capacity (Weight): 750 lbs. ; Caster/Glide/Wheel: Two 5" TPR Fixed-Position Casters; Two 5" TPR Swivel Casters; Material(s): Structural Resin.